Our beautiful estate provides a luxury experience for those that seek the very best. Enjoy waking in to an unsurpassed view, in a lavish but comfortable, riverfront home. Explore the property and experience a worldwide collection of objects and oddities which will entertain and intrigue you. Begin your day basking on one of the 4 decks to the soft sound of the river passing only a few feet away, while leisurely exploring your seemingly endless choice of activities for the day. Launch one of our Kayaks from our private dock and float alongside abundant wildlife. Walk, or ride one of our bikes, to Downtown Bend or the Old Mill District, only minutes away, where you can enjoy the unique shops, local artisans, brew pubs, and some of Bend’s finest restaurants. Golfing, hiking, fishing and mountain biking are only a few of your entertainment options. In the Great Room throw open the 16’ bank of folding doors and bring the outdoors in. Preparing your meals in the gourmet kitchen equipped with specialty appliances complemented with unique tableware. Serve up your culinary creations in the softly lit interior dining area or enjoy your feast on the outside covered patio – both feature unique handmade tables from Bali that seat 10. Sip complimentary champagne out of Waterford crystal under the High Desert's star studded skies and contemplate your evening activity choices. A soak in the hot tub? Watch a 3-D movie? Relax by the oversized fireplace? Or snuggle on the upper deck and watch the moon rise over the river. Our heartfelt goal is that your will create a memory that will last you a lifetime. I am a 5th Generation Born and bred Oregnian who . I currently live and play in my homes in Bend and in Bali for part of each year. As I continue my international travels, I hope that you will enjoy the opportunity to experience all that is my home, Daughter Water Estate. I fell in love with Bend the first time I visited and over the years, as I continued to return to Central Oregon to vacation, I vowed to retire to the sunny-side of the state. In 2001 I realized my dream of moving here but it was not until 2010 that I finally bought what I had always wanted: waterfront property in town. The creation of my estate has been a work of love inspired by a goal of providing a space where people can come together in comfort, beauty and grace. I spent two years to design and create this home. Much of the construction materials and many of the custom interior appointments I purchased in Bali. Then, having lived overseas on and off since 1982, and having traveled extensively, I decorated the home with unique and beautiful art from the world over. A luxury experience for those who seek only the very best, we provide a concierge level of service. You will be greeted by our on-site manager and escorted around the estate to acquaint you with the amenities. Fresh flowers and chilled complimentary champagne, wine or local brew will be set out in the dining room so that you can toast the start of your stay. Need a chef? Have questions about things to do or see during your stay at Daughter Water Estate? Again our on-site manager will be available to support you in having your very best vacation ever. Use the bike trail to bike the 10 blocks to Historic Downtown. Or go for an afternoon stroll along the trail to The Old Mill shopping center. Immerse yourself in resort lifestyle in Bend, OR with great restaurants, extensive Brew culture and unlimited outdoor activities. Enjoy free Festivals locally sponsored throughout the year. The Deschutes River runs through Bend and defines its character. In our Riverfront Estate you can fully explore a river experience. Kayak, SUP, float the river or lounge and enjoy the river view. Look upriver through overhanging pine trees, to the Water Park and the smoke stacks of the Old Mill. Watch the wildlife fly along the river all year and the kayaks and floaties glide by in the summer. Luxuriate in the covered gazebo alongside ducks on our 100 feet of Deschutes River waterfront. Swing your toes over two docks and take off in a kayak or a SUP from our boat launch. You can't ski in or ski out BUT it is 30 minutes from our driveway to being on the chairlift on Mt. Bachelor!! Large parking area interior to fenced yard will accomodate 4 or more cars. Gourmet kitchen with huge island; bar with beverage center; dish warming drawer. Books for use at the home only. Please do not remove books. Covered balcony off of Family room. Can be used as a Sleeping Porch in summer. Complimentary bikes for your use. Generally there are 6 or more bikes. This varies as it depends upon how much damage has been done from use. ADA accessible zero thresh hold entry and one bathroom. Two bedrooms and decks on main floor also easily accessible. A baby crib and baby umbrella stroller are located in the garage and are available for your use. Our stay at the house was perfect. The house is very well appointed and comfortable. We appreciated the hospitality and the local craft brew welcome. The house is so well positioned on the west side, close to downtown and the west side brewpub scene. Now we just need to come back in the summer to live the river life! Your perfect stay is our goal! We are so happy you had a wonderful time. We look forward to you staying with us again in the summer! Overall very good. We had a group of 10 men for a ski trip. Counting the "yoga room"there are 5 bedrooms, so using a few aerobeds or pad can sleep 10. There was plenty of room, the layout with the kitchen and living room was excellent. The kitchen was well appointed. The table easily sat 10, could go up to 12. The hot tub was perfect. We couldn't use a lot of the outdoor space since it was snowing, but we could see in the summer the available space would greatly increase with multiple decks. It was within easy driving, or a nice walk, to downtown and restaurants. Definitely would come here again. Debbie Mooney was very attentive and helpful. We are so happy that your experience at our beautiful home was awesome. October is a lovely time to use our fleet of kayaks on the river. You never know when you'll get surprise glimpses of all the wildlife. We hope to see you again for another of your family get togethers. The home is even better in person than the pictures! Location, river setting, and quality of the home went beyond our initial expectations. We enjoyed everything about the home and options available, including the kayaks. The home is highly recommended as wonderful place to enjoy all Bend has to offer. Exceeding expectations is our goal at Daughter Water Estate! Our elegant home with its premier location situates you to easefully experience the best of Bend. Thank you for your review and please come back again during one of the towns festivals or many other events. Had a lovely 40th Birthday weekend with friends. Home was lovely with everything we needed for relaxation and adventure. Daughter Water Estate’s large gourmet kitchen and expansive great room are great for gatherings of family or friends. Our goal is to make sure you have everything you need for a wonderful stay. We look forward to having you back again. We loved this house. 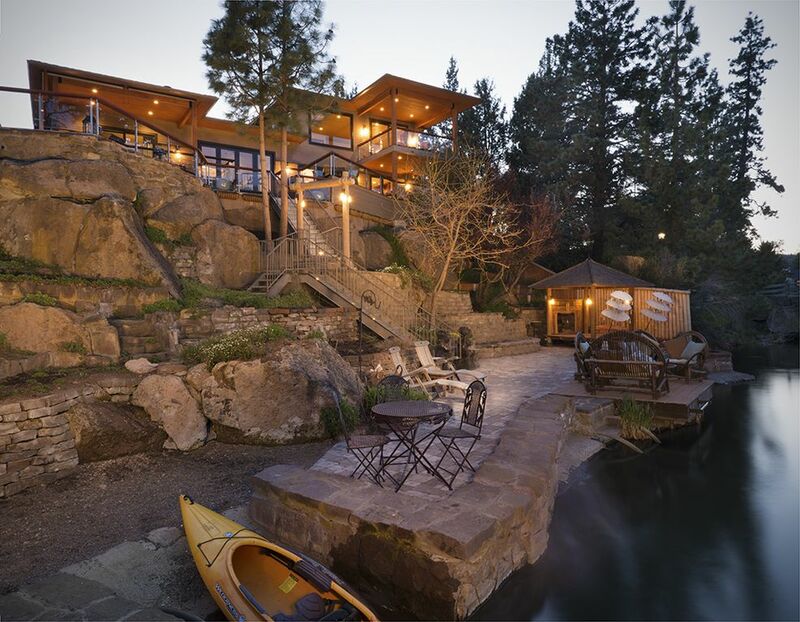 Right on the river and close to everything in Bend. Kids never even turned on the TV. The patio is beautiful and the landscaping is amazing. would love to stay here all summer. Hope to return some day. Sipping a cold drink on the river patio surrounded by flowers or kicked back on the sofa on the upper deck are perfect ways to enjoy your time in our amazing home. Meanwhile the kids can use our kayaks and SUPs or float the river in one of the floaties. We are so happy you had an amazing stay. We look forward to hosting you again. In Bend, you are surrounded by nature, both developed and undeveloped. Whatever you like to do: ski, hike, bicycle, kayak, rock-climb, or white-water rafting, you can find it close by. The renowned powder slopes of Mt. Bachelor Ski Resort along with multiple snow parks and cross country trails are 20-30 minutes away. Just up the street from our Estate, go to SunCountry Tours to go raft the Deschutes River. Or head up the mountain to serene mountain lakes and go canoeing. You can hike miles of backcountry trails starting right from our front door! With 20 golf courses, Bend boasts having as many golf holes as there are days in the year. Numerous weekend Festivals throughout the year offer up free music and entertainment. Take the family or the dog to any of 37 local parks and, when you're done, see a locally produced play or hang out at one of our local craft breweries and sample the local drafts. Stroll the floors of 10 local art galleries and get a peek into our thriving art community. With 300 days of sunshine, you can come play in the “Bend Experience” year round. Call for Off-Season reduced rates for small parties. Monday, Tuesday, Wednesday business traveler rate of $200 for one person. Mandatory $99 property damage insurance required.